The “McDonald’s Coffee Case.” Everyone thinks they know the story. Someone goes to McDonald’s, pours hot coffee in their lap, sues and wins a multi-million dollar judgment. Simple. The stuff of late night comedy. Heck, Seinfeld even spoofed it. But the real facts are far different. And the New York Times has just released a short video report that does a fair job of telling the real facts. You can view it here. The NY Times report is clearly based on the work done by film maker Susan Saladoff in Hot Coffee a documentary film on tort reform. Saladoff’s film should be required viewing for anyone who “thinks” they know the story behind the case. The real facts? The jury awarded Stella Lieback $200,000 for multiple 3rd degree burns to her crotch, legs and buttocks. She underwent extensive skin grafts to close the severe burns. Then the jury found Ms. Lieback to be partially at fault, reducing the verdict. The millions came in because the jury awarded punitive damages equal to just 2 days of McDonald’s coffee sales. Why? Because the evidence was that McDonald’s policy was to brew and store coffee at a temperature 20-30 degrees hotter than a traditional coffee maker, at a temperature that they knew would cause scalding burns if spilled or consumed without cooling and because over a 10 year period McDonald’s had settled over 700 cases involving burns. The jury felt that punitive damages were the only way to send a message to McDonald’s to turn down the temperature. 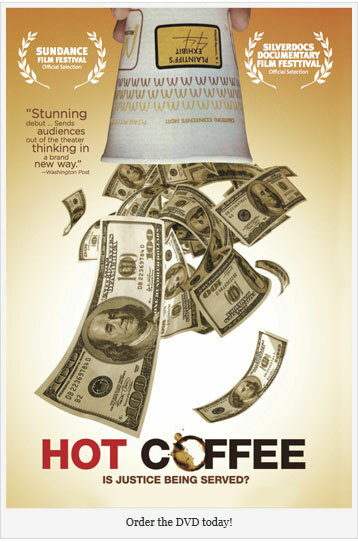 Hot Coffee is available on iTunes and NetFlix.